Welcome to Sustainable Paving Systems, our product, Grasscrete® is an environmentally friendly solution for your emergency vehicle access, water management and traffic applications.Grasscrete provides the availability of using single-use formers to create a monolithic reinforced ready mixed concrete pour that forms a pervious pavement structure with voids that are opened after the concrete hardens that can be utilized as an exposed application with crushed stone or concrete or utilized as a concealed system with vegetation such as grass or native ground cover.Grasscrete offers the ability to provide year-round access for a variety of applications requiring structural paving surfaces without compromising the aesthetics of the exterior landscaping. Grasscrete is a very sustainable product that can employ a large recycled material content both in the form of aggregate and binder such as fly ash or slag—its lifespan is indefinite and can be recycled itself to form the aggregates for future Grasscrete applications; providing a truly sustainable, eco-friendly system to accommodate a variety of needs. 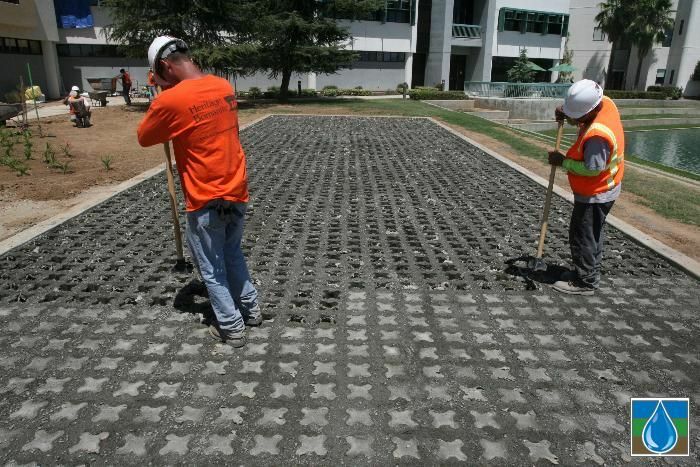 The selection of Grasscrete is one of the easiest ways to achieve LEED® points due to the reduction in heat island effect, management of storm water runoff, recycled content used in the application process as well as the concrete and sub-base, the long lifespan and the low maintenance required.